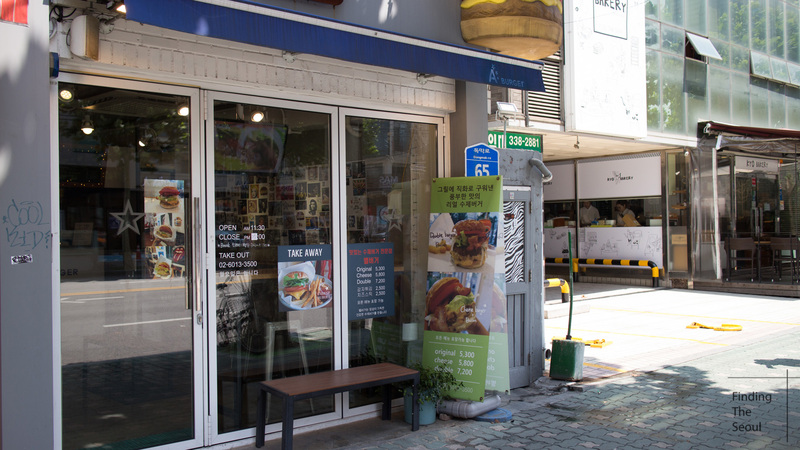 Had to get off from my rather long blogging hiatus to share this wonderful homemade burger restaurant located near the trending Sangsu (상수) area near Hongdae. While checking out the neighborhood, I was drawn by the tempting photos and decided to give it a shot in the morning. Boy am I glad I did. To be frank, I haven’t had a burger in my 2 years here that can hold its own against the best I’ve had in America. With western food becoming increasingly popular, I was baffled as to why. This place finally showed me a light in a dark world of overly dry burgers. 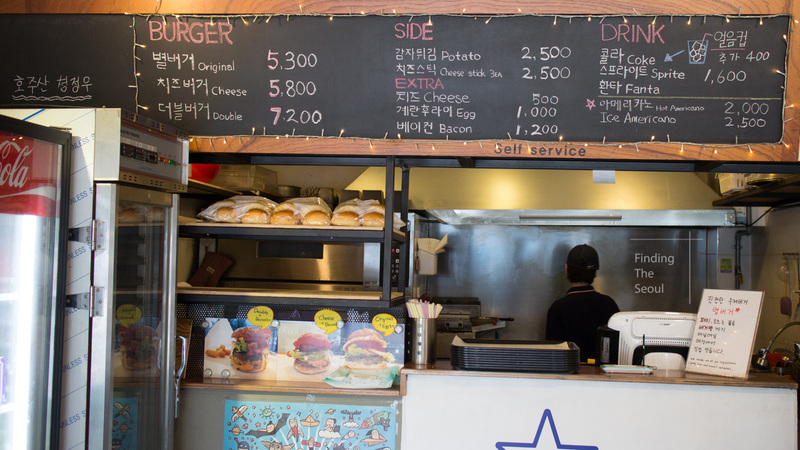 As you can see the menu is extremely simple, focusing more on the burger instead of gimmicks. 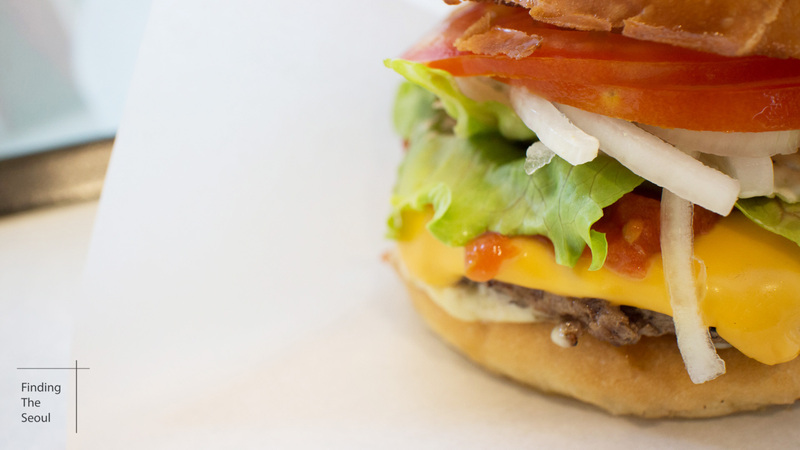 Everything is very simple with only a few extra toppings you can add to the burger. 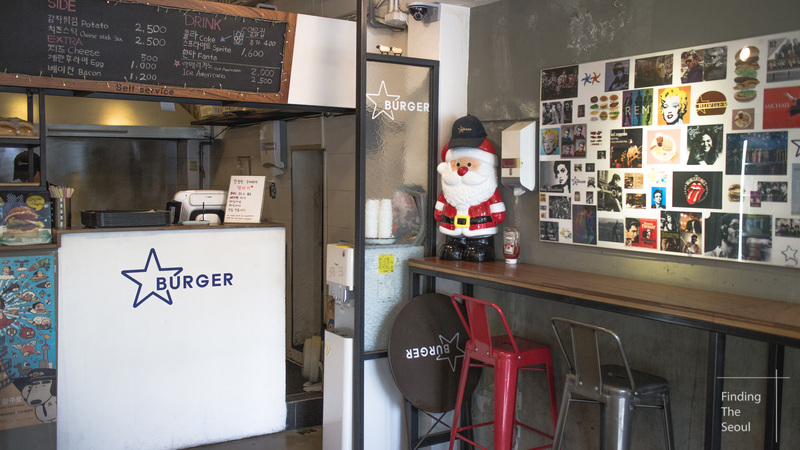 This place is very purist and focuses on the core burger while adding ingredients that don’t overpower to highlight the quality of their burgers. Seating is quite limited with space for about 8 to 10 people maximum. I think most of the orders are to go. The interior is very industrial feeling and very clean. Buns made fresh from the oven! 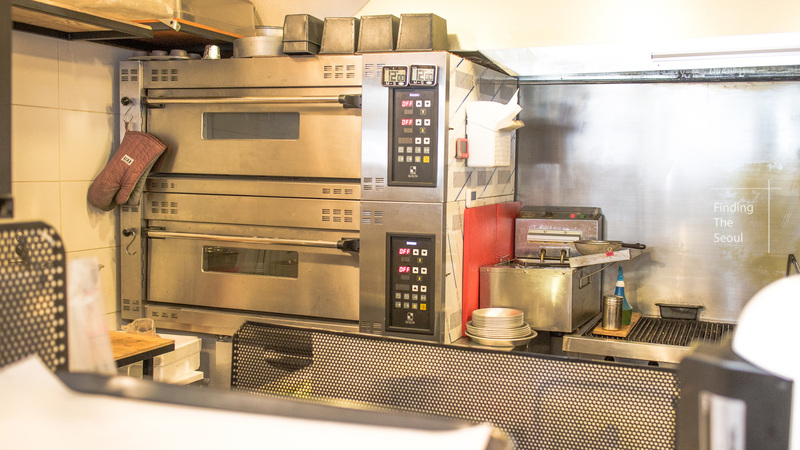 Everything is fresh and the buns are made in-house as well. While talking to the owner, I had found out that she actually used to run a bakery and a restaurant, which made me more excited to try it out. The owner was especially nice! 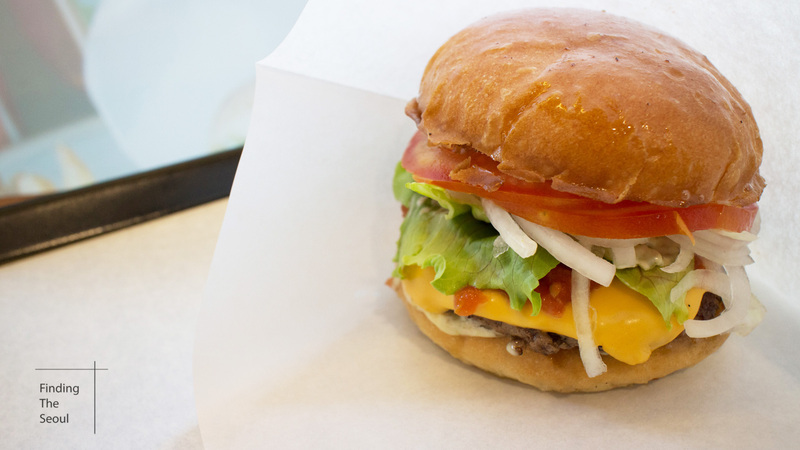 The cheese burger is not extremely gigantic, but neither is it extremely small. It’s somewhat smaller than a Burger King whopper, but packs a load of fresh, uncooked veggies and a reasonably thick, moist burger patty making it more filling than the size would suggest. The veggies are fresh and are stacked nicely with tomato sauce oozing as well as a little mayonnaise-based sauce that isn’t overly greasy or offensive (I hate mayonnaise, but this is quite good). The buns are slightly toasted and the top is coated in some sort of light oil that just makes it look a little more presentable. The buns have a nice light feeling with a little more resistance on the shell. They compliment the burger very nicely. The burger patty is cooked just about perfect. It’s well done, but still manages to keep a lot of juice and moistness. 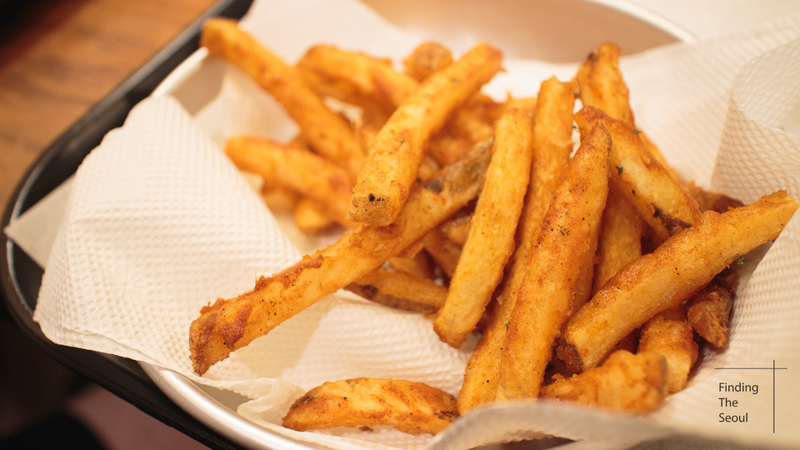 It’s cooked properly on a grill with some crispness from the charring. There was burger juice on my paper, something I haven’t seen on all the burgers that I’ve eaten in Korea (granted I haven’t had THAT many). The burgers here are what burgers should be. They shouldn’t rely on gimmicks and just add ingredients that compliment the burger patty without overpowering it. One thing that was a little upsetting was that they didn’t have options like grilled onions and sometimes the cooking was a little inconsistent from the times that I’ve been there. 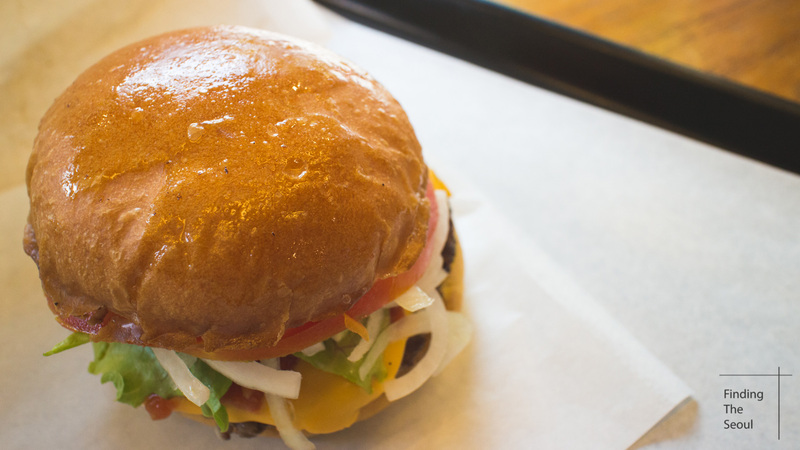 The bun was sometimes not shiny and the burger patty was a little less juicy, but at least it was still very moist. Despite these inconsistencies, the overall burger provided the same overall experience for all the times I’ve been there. The fries for me, were unfortunately less impressive. They were a bit dry, but they had a decent crisp. The main cardinal sin they committed was that they were not seasoned enough. I usually love subtle tastes, but this was a bit too flavorless for me. There weren’t that many either which was a bit sad. 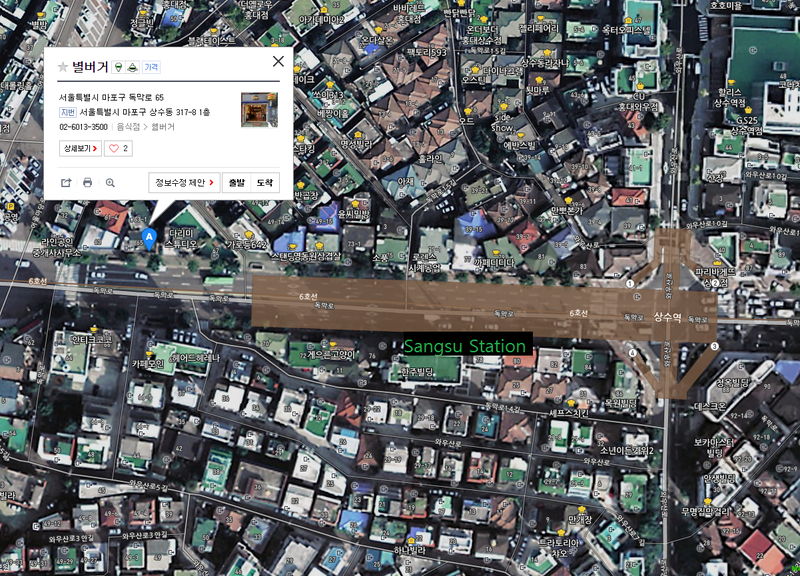 This place can be easily found by going to Sangsu Station and heading out of exit 1. Just look for the big burger sticking out of the building! 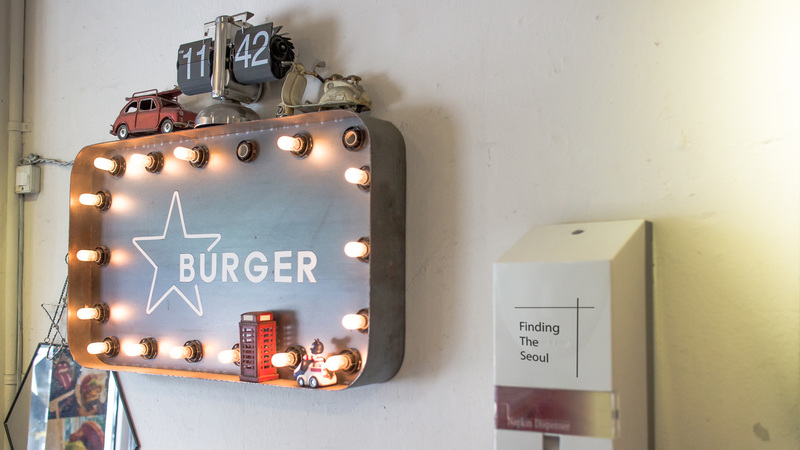 별버거 has basically become my favorite burger joint as of this posting. It represents what I want out of a burger and I’ve found myself going there two days in a row even. There is only one location and making it feel even that more special. I really hope this place does well as I genuinely believe that they deserve it. Got any places you’d like me to review? Leave a comment below! Hope it meets your expectations! Let me know how it turns out!